After Lindsay Severtson had her first child four and a half years ago, she went through a period of post partum depression. Severtson, an easygoing woman with a ready laugh, attributes her depression to isolation from other young families and lack of community support. “When you’re isolated as a mom, you’re not capable of being a good mom,” she says. “Community is essential.” Severtson remembers this experience as she talks about the neighborhood alliance she is starting up with fellow Riverwest moms Wendy Mesich and Katie Maedke. Called the Village of Riverwest Project, the alliance is a “network of people in Riverwest who are really interested in serving the needs of our community,” she explains. The project includes support networks like a babysitting co-op, regular potlucks, a family directory, home schooling groups and skill sharing workshops. 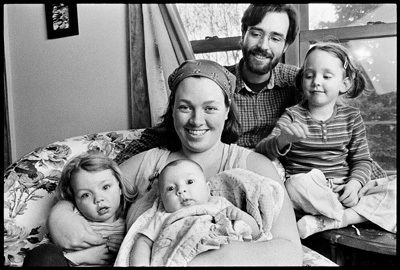 Severtson says that they will work through barter fare and “the all-encompassing philanthropy of the community.” For example, she and her husband, Scott, parents to Maggie Mariweather, four-and-a-half; Mirabelle Celeste, two; and Alexa Bloom, two-and-a-half months, can’t always find or afford a babysitter when they need one. However, Severtson would gladly watch children at her house in return for the same service when she needs it. Riverwest is ripe for a community network because the neighborhood is unusually close-knit, says Severtson. When she and her husband moved to Milwaukee from Sheboygan, they lived on the East Side. While Severtson was volunteering at the Riverwest Co-op, a fellow staffer tipped her off that a house she might like was for sale in the neighborhood. The house was the clincher, but she was already impressed by neighborly camaraderie and friendliness. “Living here has been a semi paradise,” she says. “Everything is accessible beyond race and class divides, more so than in any other place I have ever lived.” She laughs as she remembers giving a friend directions to her house, and being rebuffed by her friend’s response that Riverwest is a “bad neighborhood.” Besides loud music and loud cars, the problems of an urban neighborhood are controllable, she says. “It’s not a diseased community. I don’t think there are any more dangers than in any other community. I don’t worry about my kids being snatched.” Despite Riverwest’s reputation for housing singles and artsy types, it’s also a family friendly place. Severtson, 24, who had her first child at 19, says she hadn’t met any young moms before settling in Riverwest. These days, she finds that Riverwest is a good neighborhood for practicing her childrearing philosophy. “My kids are my politics,” she says. “I want them to live in a world different from the one I’m living in.” She is passionate about community-based schools and is hoping to start a home schooling group as part of the Village of Riverwest project. A stay–at-home mom, she plans to earn a degree in theology or anthropology when her kids are older, she says. Meanwhile, she advises parents to get to know other families and their communities. “It only takes a little bit of everybody’s time,” she says. For more information on the Village of Riverwest Project, contact Lindsay Severtson at 414-431-8559 or Wendy Mesich at 414-241-3069.